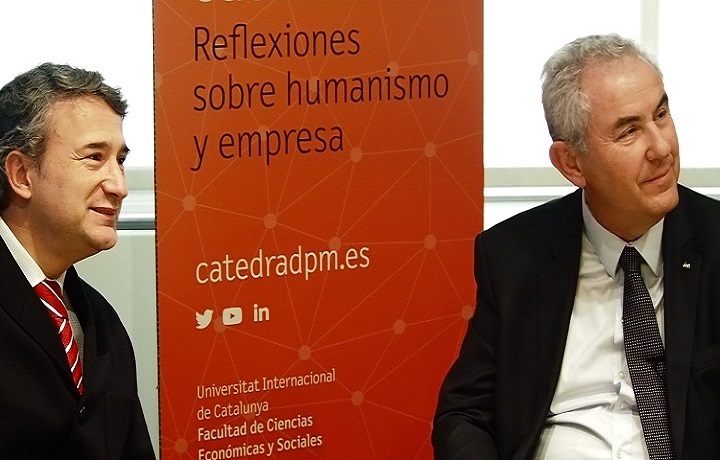 Joaquim Borrás, honorary president of the ISS Foundation, took part in the “Desayunos Cátedra” session organised by the Chair of Management by Missions and Corporate Government on 1 March. Joaquim Borrás is honorary president of the ISS Foundation’s Advisory Council and, until last year, executive chairman of ISS Integrated Facility Services, S.L., one of the world’s leading facility services providers. During his talk as part of “Desayunos Cátedra”, the speaker pointed out that the company has always been committed to people, and that people are one of the key pillars of ISS Facility Services Spain’s strategic plan. The multinational stands out thanks to its Social Responsibility policy and the level of commitment among its employees to the corporate mission. According to Joaquim Borrás, the workers are what set the organisation apart: “If you trust and encourage” the workers, they will take the company’s mission to heart and carry it out by providing good service and enjoying what they do. The businessman reminded attendees that training is essential when it comes to capacitating and motivating all members of the organisation, something accomplished through programmes that respond to the needs of both the employees (not just operational staff, but middle and senior managers as well) and the business. ISS Spain provides cleaning, maintenance, restoration, gardening, security, facility management (IFS) and auxiliary services, with specific services for each division. It employs over 35,000 people, which include 1,200 individuals with some kind of disability and close to 4,000 immigrants of over 80 different nationalities. The company also has an equality plan in place (25% of all senior management at ISS Spain are women), with special procedures for gender violence and workplace and sexual harassment. Aside from listening to Joaquim Borrás, the attendees of the “Desayuno Cátedra” session also had the opportunity to exchange their views on the subject under discussion: realising the mission.